Robyns Simple Life: Personal Summer? Well since I share just about everything on this blog why not get even more personal right?...If I have any male readers, you may want to cover your eyes or even close the page now.. Remember, I gave you plenty warning.. In the last few years I've suspected I"ve been heading towards menopause.. I've been to the doctors and although they've told me Im still kind of young it isn't impossible even if my blood work for hormones was normal.. Well this week, as soon as I find a new Dr. (last female doctor I had felt like she was ripping me apart inside with a meat hook) I will be asking for new hormone blood test and I would bet they will come back all over the map. Aside from my breasts being horribly horribly painful, my mood swings are incredible.. One moment Im telling my husband I love him and the next moment I am thinking of ways to torture him. One moment I am ecstatically happy and the next I'm crying at Lysol commercials. And if you're a woman who is going through this or has gone through this, who can forget about this!! So far I am not getting the ones that make you wake up drenched as if you've been doing the back stroke in the Atlantic Ocean but suddenly I am hot like I could use a nice snow bank to crash into for about an hour.. My electric bill is going to be outrageous next month because my air conditioning is now my very best friend of all time.. I've also got some really crushing fatigue going on as well.. not an ounce of energy which, is the reason my blog has been bare.. I can't think of anything to write about and even if I could I haven't had the energy to do it.. So my fellow hormonal sisters, anyone going through this? Been through this? Care to share some advice or misery? Well I am 45 and I know something is going on with me. Periods are wonky and I get so hot sometimes. Same thing, blood work shows I am fine. I'm 45 and have been feeling very hormonal at times. I had bloodwork done too and everything was where it should be but I swear something is going on. I am trying to pay more attention to what I eat lately because I think your diet can really affect your hormones. I hope you start feeling better! Thanks for stopping by to comment on Rosie - that furminator is a lifesaver! Hi Robyn, Well I'm on the other side of this-went through menopause at 50 and can tell you the hot flashes(during the day)were continual and horrendous! There are many otc natural remedies out there-check your health food store, they helped me a lot after I started using them. I can tell you that it will end, although occasionally I do wake up sweating. Also, tried to email an answer about what I wore to the big party-I wore dark brown dress pants with a sleeveless, shimmery brown, black, tan top that I wore to a wedding several years ago. It was perfect, many wore capris but since I was helping to host(putting out food etc)I thought it would be better to look a little dressier. Hang in there, you'll get through the sweats. BTW, I also sleep warmer than I ever did when I was young. Robyn, thanks for the lovely comment, it's so appreciated, the ocean does have half my heart, and I guess that's a good thing. I get hot flashes that aren't really hot flashes, [I'm 50] they say it's perimenopause..oh really? I am either hot, or cold there is no happy medium for me, but I will not complain because a co-worker is going through menopause, and you can actually see the red rising on her body, just like the mercury in a thermometer rising up to the top. I figure if she can manage so can I....lol. Well Robyn I can say been there, done that, haha....Soo not good. I started at about 45 with mood swings, occasional hot flashes, and missing periods here and there. This went on for 5 years with all my hormone tests coming back fine. They told me perimenopause, Then! at about 50 everything really went berserk and my periods starting come every two weeks till finally it just didn't stop at all. The hot flashes were crazy. THEN! I ended up on an emergency hysterectomy at 51 because I was losing soo much blood that I was almost needing a transfusion....THEN! I was unable to take estrogen because of the breast cancer history in my family (which I ended up getting anyway) so the hot flashes became ridiculous. You can see them on my face and neck when I have them as they turn a BRIGHT red. I like Noreen got help from the health food store and it did help A LOT!! 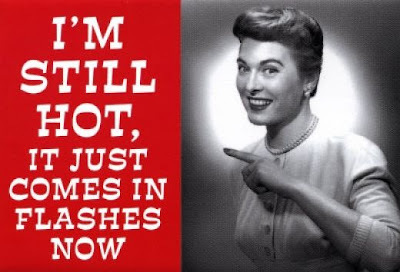 I still get occasional hot flashes but they are no big deal. I can go weeks without having any and then randomly get them for a while. At 57 for the most part they are a thing of the past. It does eventually end, and I honestly found the natural products to be a BIG help. Hang in there, this too will pass....Oh the joys of being a woman! Thanks for the comment on my bedroom furniture, it originally belonged to my daughter....we bought it for her when she was in college with the idea she would take it with her when she left home either married or to live on her own....well she married and took it. BUT! then two years ago we moved into a much smaller home and the HUGE king sized set we had for years would not fit into our new home...so we traded with our daughter as she now had the giant master bedroom. Of course we had to drive the furniture 1000 miles to their new destinations as we live that far apart. But it was worth it I think. I LOVE hers too. Well...you may not want to hear this but even after menopause you will still have hormone fluctuations. I had a pretty easy time with menopause. I was 50 and it only lasted a few months. But I still get moody and have some symptoms even though I'm a LOT older now! lol Exercise and good diet helps more than anything. Oh....and a fan! I read a lot of books to make sure what I was going through was normal. Now, you could google and get info, too. Hugs! I was lucky enough to go through "medical menopause" at 36 when I had a hysterectomy. I never experienced any of the problems that most women do. Just one day no periods and no symptoms of anything else. When I was having chronic pelvic pain they did a full hormone panel on me and it showed that I had indeed already been through menopause. When I had to have an ultrasound done of my ovaries, just in case, they couldn't find them because they had totally shriveled up! So if you are going to have lab work done, ask again for a TSH (thyroid that I know you already do) and all hormones. Might be surprised. In the meantime, get a wet wash cloth and set in front of the fan to cool down and set the ac where you both can be comfy! Robyn, I am sorry you are having "female problems" as one of my relatives used to say. I am not there yet being in my late 30's but I know how miserable the symptoms can be. My Mom is a pretty easy going person but when she was going through it, she would loose her temper so quickly. She said her hot flashes would happen at the most inopportune time which was embarrassing. Hang in there this too shall pass..................... eventually. Yes, I've been through it and have come out on the other side! I had lots of mood swings - sometimes the littlest thing would enrage me. That's what I remember the most - feeling so angry at times. Lots of crying. And the hot flashes and flushes that would suddenly transform my body. It ain't easy, but you'll get through it.